An observational single centre study. Four critical care doctors, 2 fellows and 2 consultants were trained to use TTE. The study was conducted over 2 six month study periods; period 1 before echocardiography training and period 2 following echocardiography training. An increased number of TTE examinations were performed following echocardiography training, 47 TTE studies during period 1 and 144 TTE studies during period 2. The commonest indications for TTE examination were assessment of ventricular function, wall motion abnormalities and cardiac tamponade. The percentage of TTE studies leading to a change in clinical management were similar during both periods, 30% period 1 and 34% period 2. During period 2 the majority of TTE’s leading to management change were performed by critical care doctors who frequently manipulated vasoactive medications and administered fluid therapy. A 6 month echocardiography training programme led to an increase number of TTE studies independently performed by critical care doctors with resultant clinical impact in one third of cases. Transthoracic echocardiography (TTE) has become an established component of critical care monitoring1-5 .Traditionally performed by Cardiology Services, either cardiac physiologists or cardiology doctors, a major limitation has been availability of these personnel on a 24 hour /7 day per week basis to the critical care area. As a result performance of TTE examinations has moved beyond the traditional users and now involves critical care doctors. Definition of the competencies required for basic level critical care echocardiography has provided a practical roadmap to Intensivists involved in echocardiography training6. We introduced a basic level echocardiography training course into our critical care unit and it was the aim of this study to evaluate the impact of echocardiography training on clinical practice. This observational single centre study was approved by the Hospital Ethics Committee. The critical care unit contains 17 Intensive Care and 13 High Dependency Unit beds receiving approximately 2,600 admissions per annum. The study population was consecutive critically ill patients requiring a TTE examination. Indications for performing TTE were at the discretion of the attending doctors, according to the standard of care. Transthoracic studies were performed with Vivid i, Vivid q, Vivid Ô machines, General Electric, Wuakhesa, WI, USA). Four critical care doctors underwent echocardiography training; 2 critical care fellows who had greater than 2 year’s clinical intensive care experience and 2 critical care consultants. None of the participants had previous training in TTE. Echocardiography training was conducted by an intensivist (FC), with level III competence in TTE according to the European Association of Cardiovascular Imaging Guidelines7 and an experienced senior cardiac physiologist (RO’M). The echocardiography training programme was of 6 months duration and included; 42 hours hands-on echocardiography training delivered at the bedside in weekly 2 hour sessions, a 10 hour lecture series delivered over 2 days, and the completion of a log book of 30 ultrasound studies. The log books cases were inspected by the supervisors of training and if satisfactory each case was co-signed by trainee and supervisor. The lecture series included teaching on ultrasound instrumentation and optimization of image quality. In addition the lectures emphasized the echocardiographic patterns seen in clinical syndromes that occur in critically ill patients; severe hypovolaemia, left ventricular failure, right ventricular failure, cardiac tamponade, acute massive left-sided valvular regurgitation, cor pulmonale and hetergeneous contractility seen in myocardial ischemia and severe sepsis. Data were collected over two separate 6 monthly study periods, period 1 which was before the echocardiography training programme during 1st March to 31st August 2012 and period 2 which was after the echocardiography training programme during 1st September 2012 to 28th February 2013. Data were retrospectively collected during period 1 when TTE studies were performed by cardiac physiologists, and cardiology doctors. Data were prospectively collected during period 2 when TTE studies were performed by cardiac physiologists, cardiology doctors and the 4 critical care doctors who had completed basic level echocardiography training. During both study periods the parasternal, apical and subcostal acoustic windows were routinely imaged. The number of acoustic windows obtained was recorded and global image quality was graded as follows; optimal defined as 3 acoustic windows obtained and clinical question answered, suboptimal defined as less than 3 acoustic windows obtained but able to answer the clinical question and inadequate defined as unable to obtain any of the 3 acoustic windows. All personnel performing TTE had the same access to information regarding medical history and clinical status of the patients. A report in real-time was documented by the critical care and cardiology doctors. In the case of cardiac physiologists, a verbal report was issued and a formally completed report by a cardiology consultant usually within 48 hours. Results were expressed as means and standard deviations, or percentage. The number of acoustic windows obtained, the proportion of optimal, suboptimal versus inadequate imaging quality and the proportion of addressed clinical questions were compared before and after echocardiography training using the Chi-squared McNemar tests. A p value of <0.05 was considered significant. During the two study periods 2,215 patients were admitted in the critical care area. There were 47 TTE studies performed during period 1 and 144 TTE studies performed during period 2. Patient characteristics during the study periods are detailed in Table 1. Results are expressed as numbers or mean ± standard deviations (SD). Numbers in parentheses are percentages. Reasons for Intensive Care Admissions: Cardiovascular; acute coronary syndrome, pulmonary oedema, pulmonary embolism, post cardiac arrest, cardiomyopathy, aortic dissection medically managed. Respiratory; ARDS, pneumonia, COPD. Other Medical; seizures, subarachnoid haemorrhage, stroke, viral encephalitis. The most common clinical indications for TTE in both the pre- and post- echocardiography training periods were assessment of left ventricular function, assessment for regional wall motion abnormalities and assessment of possible cardiac tamponade. 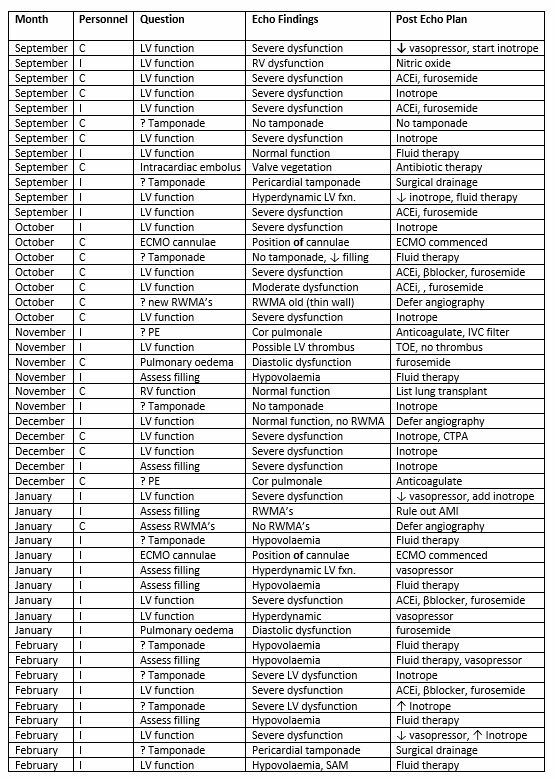 A full list of indications for echocardiography during both study periods are outlined in Table 2. Following echocardiography training, during period 2, additional indications for TTE included assessment of volume status, assessment for cor pulmonale and check positioning of cannulae for extracorporeal membrane oxygenation. During period 1, before echocardiography training, 45/47 indications for TTE were satisfactorily answered. In one case endocarditis could not be ruled out and in another a possible intracardiac source of embolus was not clarified. The former patient subsequently had endocarditis ruled out by transoesophageal echocardiography (TOE). During period 2, following echocardiography training, 135/144 indications for TTE were satisfactorily answered. In 3 patients it was not possible to rule out cardiac tamponade, in an additional 3 patients an intracardiac source of embolus could not be confirmed, in 2 patients endocarditis could not be ruled out and in 1 patient it was not possible to rule out a pulmonary embolus. The three cases of possible tamponade were subsequently confirmed by TOE and the case of possible pulmonary embolus was ruled out by CT pulmonary angiogram. Image quality was considered optimal in 18 (38%) cases, suboptimal in 28 (60%) cases and inadequate in 1 case (2%) throughout period 1. Image quality was considered optimal in 68 (47%) cases, suboptimal in 75 (52%) cases and inadequate in 1 case during period 2. One hundred and three of 141 (73%) potential acoustic windows were imaged during period 1 (parasternal 37, apical 46, subcostal 20) and 340 of 432 (78%) potential acoustic windows imaged during period 2 (parasternal 130, apical 123, subcostal 87). A change in clinical management that followed a TTE study occurred in 14/47 (30%) of cases during period 1 and in 49/144 (34%) of cases during period 2 study period. Details of these changes in clinical management and the personnel (either cardiology or critical care doctors) who performed each TTE study are outlined in tables 3 and 4. By the end of period 2 the majority of TTE studies were performed by critical care doctors. During that period most of the TTE studies that led to a management change were performed by critical care doctors (32/49) Table 4. TTE, transthoraic echocardiogram; I, Critical care doctor; C, Cardiology; LV fxn, left ventricular function; Mod. RV., moderate right ventricular; ACEi, ace inhibitor; Intracard. Embolus, intracardiac embolus; ECMO, extracorporeal membrane oxygenation; RWMA’s, regional wall motion abnormalities; PE, pulmonary embolism; Pulman. Oedema, pulmonary oedema; Assess RV fxn, assess right ventricular function; CTPA, CT pulmonary angiogram; SAM, systolic anterior motion. Following the introduction of a basic level echocardiography training programme for critical care doctors, there was more than a threefold increase in the number of TTE studies performed in the critical care unit. This was due, in part, to the increased availability of newly trained ICU doctors who performed TTE when required. We are not the first to report the close relationship between the number of echocardiograms performed and the availability of skilled ICU doctors8. The percentage of clinical questions answered by TTE was > 90% both before and after echocardiography training. Findings on TTE led to a change in clinical management in 30 and 34% of cases respectively before and after echocardiography training. This is consistent with previous studies demonstrating a therapeutic impact of TTE in between 25- 51% of cases in critically ill patients 1,9,10. Following echocardiography training the majority of TTE studies that led to a change in clinical management were performed by critical care doctors. The management changes increasingly involved real-time manipulation of vasoactive medications, both vasopressors and inotropes and administration of fluid therapy. Echocardiography was being utilized as a haemodynamic monitor. Cardiology training and practice emphasize valvular heart disease, heart failure and coronary artery disease. There is little prominence given to the role of TTE as a haemodynamic monitor, or to assessing ventricular function related to levels of vasoactive medication support or to diagnosing hypovolaemic shock in the critically ill 11. Echocardiography can accurately predict fluid responsiveness and has been demonstrated to be effective in guiding inotrope and vasopressor therapy 12, 13. Intensivists are well positioned to integrate the haemodynamic information gained from an urgent TTE study into the clinical status of a critically ill patient. They do this in the context of having already completed a haemodynamic assessment of that patient. This use of echocardiography as a cardiac monitor should be distinguished from its diagnostic role. The threshold to subsequently order a standard, cardiac physiologist performed, TTE study should remain low. In the present study, following echocardiography training, there was actually an increase in the number of TTE studies performed by the cardiology service. Perhaps echocardiography training per se, by promoting a greater understanding of the indications for and benefits of TTE in critically ill patients led to an enhanced utility of this non-invasive test. Training in TTE requires mastery of both cognitive and technical skills. In the current study, echocardiography training closely followed a recommended curriculum set out by experts in the field 6. Despite widespread acceptance of the importance of echocardiography in critical care, there is still a relative scarcity of qualified personnel to implement hands-on training14. An experienced cardiac physiologist, in the present study, was key to delivering hands-on-training within the ICU environment. Critically ill patients offer an echocardiographic challenge presenting poor acoustic windows and are difficult to image even by skilled echocardiographers 15-17. The high percentage of suboptimal images both pre and post echocardiography training reported in the present study is common in this environment. The 6 months course duration was designed to promote the technical skills to meet these challenges. 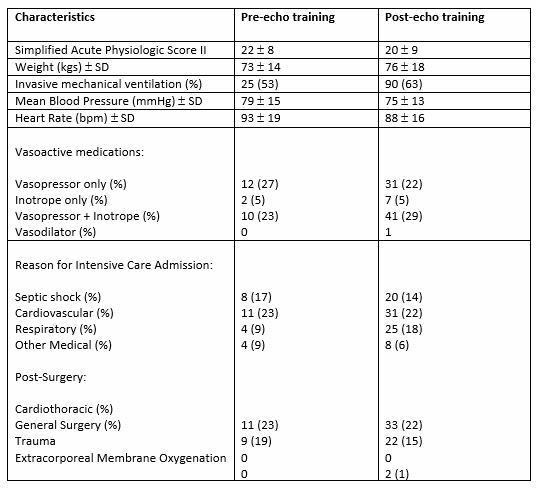 This study demonstrates one approach to incorporating a basic level of echocardiography training into a busy critical care ward. An increased number of critically ill patients benefited from the additional haemodynamic information available through echocardiography. This positive clinical impact reinforces the imperative for incorporating basic level echocardiography training as a mandatory part of critical care fellowship training programmes.